Remarkable fruit for mild-winter climates in So. California & Arizona. Large yellow apple with slight red blush. Heavy crops of sweet, crisp, sweet-tart apples even in low desert. Fresh/cooked. Keeps 2 months in refrigerator. 200 hours. (low chill) Self-fruitful or pollinated by Dorsett Golden or Einshemer. Late June harvest. A fond selection from Bahamas Dorsett is thought to be the lowest chill apple selection in production to date, needling less than 100 chill hours for successful production. This bright yellow blushed reddish pink fruit has a white flesh with firm texture and excellent quality. It’s most popular as a fresh fruit but also works well for cooking, canning and freezing. Dorsett can be stored for 3 months after harvest. It’s self-fruitful and also works well as a pollinizer for other early season apples, like Anna. Dorsett harvests from June through July in the southwest and often produces a second smaller crop in late summer. Imported from Japan in the 1060’s Fuji is a cross between Ralls Janet and Delicious. Once thought to require high chill, Fuji has proven itself as a reliable producer throughout the low-chill southwest. We now rate it at less than 500 chill hours and for all practical purposes it should be considered in the 200-400 hour range. Fuji’s exterior color is a lackluster yellowish green with a blush of orange. Its interior color is a creamy orange yellow with a wonderful crispy, crunchy sweet flavor so don’t let its dull exterior fool you. 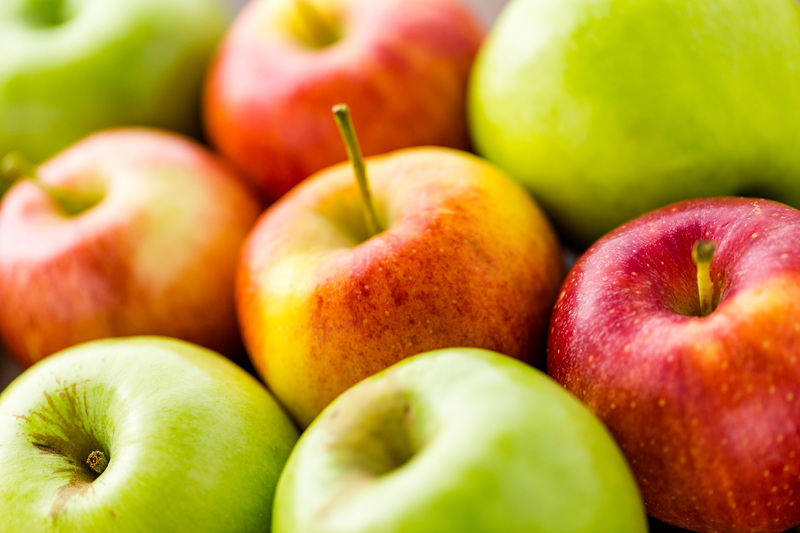 Fuji has fast become one of the most popular apple varieties in the world. Fuji is self-fruitful and is also recommended as a pollinizer for other mid season apple varieties. It’s ripening in the southwest is from late August through October. Fuji is also an excellent keeper and can maintain good quality for more than six months. Low acid high sugar levels. Wonderful dessert apple from New Zealand. Crisp, nice blend of sweetness and tartness, rich flavor. Skin reddish-orange over yellow. Early harvest, 2-3 weeks before Red Delicious. Good pollenizer for other varieties. 500-600 hours. Self-fruitful. Vigorous tree. Long shelf life. Long time favorite for its sweetness and flavor. Reliable producer, adapted to many climates. Medium to large size, yellow apple with creamy white flesh. Pollinizer for Red Delicious. Mid-season harvest (September in Central California). 700 hours. Self-fruitful. From New Zealand. Large, late, green, all purpose. White fleshed. Crisp, tart, excellent keeper. Requires long summer. Thrives in hot climates. 600 hours. Prolong bloom: good pollinizer for other apples. Self-fruitful. Late season harvest. Sweet, flavorful, medium to large sized red apple with creamy white flesh. Early fall. Small, compact tree. Good pollinizer for most other apples. 700 hours. Pollinated by Liberty, Granny Smith, Golden Delicious, Fuji, Gala. Cross between Fuji and Gala. Crisp, sweet and very flavorful. Excellent eating apple. Excellent storage capabilities. Skin is reddish-orange. Fuji makes a good pollinizer. Requires between 550 – 600 Chilling hours.